If you’ve seen even a second of Lo!’s instantly iconic music video for their 2015 track “Orca,” these words will immediately transport you right back to its mesmerizing yet jarring visuals. Vocalist Sam Dillon rises Cthulhu-like from a vat of strikingly pink goo, the substance oozing down his writhing form while his bandmates, clad uniformly in rubbery black hazmat suits with matching gas masks, blaze headlong through the ruthless instrumentation. If viewers were left with one impression, it was that Lo! are not a band who are afraid of bold statements. After launching themselves into the world’s metal consciousness with their 2015 EP The Tongueless, Lo! could have gone one of two ways with whatever came next. Either they’d build upon their prior victories, proving their worth on the global stage, or they’d fail to deliver and so disappear back into the hordes of hopefuls and has-beens. After two years’ more of toil, Lo! have returned bearing the vile gifts for which their fans have been so ardently waiting. Lo!’s third full-length record Vestigial is the boldly declarative follow-up statement the band needed to make in order to sustain their momentum, reinforce their claim on the contemporary metal landscape, and send them careening over the edge to greater acclaim. The album builds confidently on the foundations laid down by The Tongueless, as the identity established over the EP’s four tracks is given much-needed space in which to crystallize and expand. 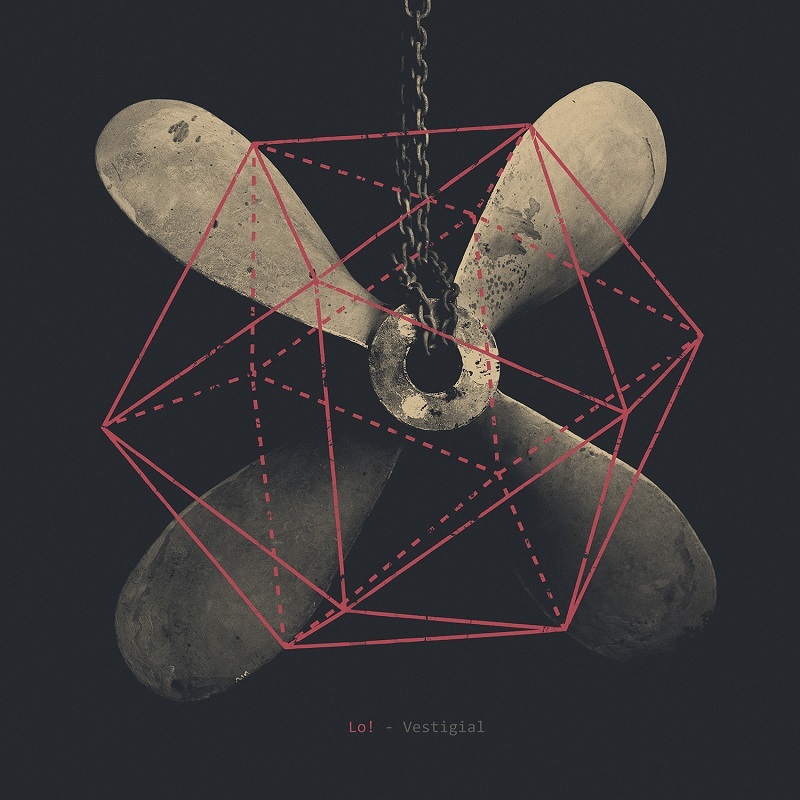 Vestigial, with its 11-track runtime, is the band’s second work with Dillon on vocals, and it is tightly packaged with a laser-honed stylistic focus. Though Lo! are unafraid to allow themselves room for exploration, the music retains at all times a definitive aesthetic which showcases the band’s confidence as well as songwriting skill. Lo! are as comfortable with aggressive technical riffs as they are with swampy sludge muck and ethereal melodies, even experimenting successfully with relatively lengthy instrumental movements. “Glutton” and “Bestial Beginnings” are razor-sharp masterworks of oppressive sludge, yet both employ melodic lines and quieter passages in a way which subtracts nothing from the songs’ hope-gutting suffocation. Though parallels can be drawn throughout to Lamb of God, album closer “Gods of Ruin” brings Lo! closest to their legendary forebears. Even black metal, a fashionable touchstone for many current metal bands, makes an odd-time-tinged appearance in the verses of “Judas Steer,” where it is immediately followed by a sinister hook steeped clearly in bluesy southern-rock roots. “A Tiger Moth’s Shadow” and “The Worms Lament” highlight the band’s willingness to deconstruct traditional notions of song structure and arrangement. Across the album, Lo! consistently demonstrate a superior grasp of song progression and mood craftsmanship. Though Lo! are attentive enough provide the listener with numerous oases in which to breathe, they unfailingly return to complete and utter devastation. For every moment of mayhem and madness, there is a corresponding passage of gracefully ghost-noted drums, solemn bass and single-note guitar melodies, and another still of ribcage-crushing heaviness and desolation. Even the album’s quieter moments are tinged with the urgency of impending doom. There are no happy endings on Vestigial, only the smothering bleakness of ruin. The album’s mix is unabashedly led by Adrian Griffin on drums, his cymbals carving and cauterizing a path through the sticky clutches of Carl Whitbread’s guitar. Griffin’s performance is captivating, and it’s no wonder his drums are given so much prominence in the music’s sonic terrain. Dillon’s vocals hold command in the back, serving often as rhythmic texture and accent. While the overall sound is caliginous, each performer is allotted enough room and clarity to be heard, and this approach serves as a perfect complement to the band’s gloomy songwriting style. With Vestigial, Lo! assertively lay claim to a discrete vision of which they are the artisans and architects. Their latest music video, for the fourth track “Locust Christ,” cements bassist Adrian Shapiro as a visual artist in his own right. The moment at 00:30, with the woman’s dead-eyed gaze as she turns her head to stare at her partner, the camera tightening up its focus just a hair – this is more disturbing than anything which follows in the video, and that’s no small understatement. Shapiro appears to be one of the rare talents who possesses both the creativity and restraint to explore horror in a way that is subtly creepy without barreling all the way through to cheesily overdone. With such a strong and unsettling artistic vision across numerous media, Lo! are strong contenders to carry the torch borne for so long by Adam Jones and Tool, in terms of the level of care and handling given to the presentation of their work, with music and visuals married into one unified statement. Lo! are a full-package band who have consistently paid as much attention to their album packaging and now music videos as they have to their music itself. With the disinterred, reanimated corpse of nu-metal rearing its maggot-ridden head for a seemingly inevitable resurgence, Lo! may just be the balancing force of nuanced artistry needed to weather the storm through these troubled times. Vestigial is out now on Pelagic Records. Lo! are currently in the midst of a European tour through the end of month in support of the record.